We're pleased to have Kyrun Silva join us at Free Comic Book Day Mini-Con 2014 on Saturday, May 3, 2014. Kyrun embodies what this celebration is about: A love for bringing ideas to life. We think you'll enjoy this interview with Kyrun and hope you'll take some time to pick up and read his new book, Shaman's Destiny. Kyrun Silva was born and raised in Sacramento, CA. His earliest memories are of drawing characters in his room while blaring cartoons on TV. As a young boy, Kyrun couldn't stop drawing and creating. He says, "I always knew I wanted to grow up and do something with my artwork. I was fascinated with everything from cartoons to sci-fi, fantasy and other geeky things, but comic books was my main addiction. From the storytelling to the beautiful artwork, I knew I had to be a part of this world." Last year, the prodding and pushing of his wife and friends moved Kyrun to publish his own series, and thus was born Big Tree Comics to house his ideas and stories. His first book was “Shaman’s Destiny”. Kyrun wrote, drew, inked, and lettered the book, taking about 3 months from start to finish. "This book is going to be everything I love in fantasy stories. I wanted to create a fantasy story like Avatar The Last Airbender, The NeverEnding Story, The Lord of the Rings or Skullkickers, but I wanted to set it in the real world." The goal of Big Tree Comics is to create stories with diversity -- not just diversity in the characters, but in the stories as well. Kyrun adds, "Though I love superhero comics, I want to make more than just the standard spandex stories. I have ideas that range from fantasy, to supernatural to superheroes. With each book I want to create tales that bring lasting memories to the reader and hopefully inspire someone to also create their own story." Empire's: Tell us a little about your creative process. Kyrun: My process is to sit down at the computer and start writing. Then I thumbnail what I’ve just written. After that, I tear up the page I just drew and start over. After redrawing the same page a few times, I cry for 30 minutes and scream to the heavens for inspiration. Then I take the torn up pages from the first attempt and think, “Hey, this wasn’t as bad as I thought it was,” and redraw it exactly like I did the first time. Empire's: Who inspires you to draw? Kyrun: I draw inspiration from my wife and my mother. My mom, a single-parent, raised me. She worked multiple jobs and commuted long hours every day to provide for my sister and me the best life she could. Watching her work hard made me realize that I needed to push myself to reach my dreams. My wife grew up speaking English as a second language. Also, as a child, she didn't have a lot. She pushed herself through high school and earned a college degree while working and carrying our first son. She inspires me to keep pushing myself and not give up on goals. Empire's: Why do you love what you do? Kyrun: I do what I do because I’ve always wanted to make comic books. I grew up drawing all the time. At times, when I should have been studying for school or doing homework, I always found myself drawing. I would find myself sitting down with a pencil and a sheet of paper and just drawing for hours at a time. That love of drawing stayed with me to this day. Even when I’m at my 9 to 5 job now, I find myself doodling and drawing everyday and trying to stay creative whenever I can. It's an obsession of mine. I'm always wanting to push myself. Empire's: So, do you have anything special planned for our Free Comic Book Day Mini-Con? 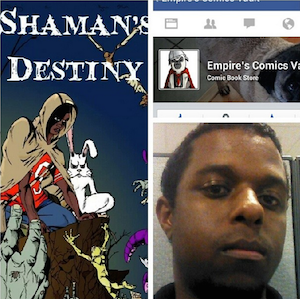 Kyrun: I am debuting issue #2 of my series “Shaman’s Destiny”. I will also have a couple of prints for sale. I plan on doing sketches at the show. I'll be giving them away to kids. Empire's: That's fantastic. Very exciting. Tell us about some of your favorite comic books and movies. Kyrun: My favorite comic book: I can’t pick just one! There so many great comics and series that I’ve read over the years. Here are some of my favorite books: “The Dark Phoenix Saga”, “Dark Knight Returns”, “Watchmen”, “Darkhawk”, “Batman: Court of Owls”, “The Walking Dead”, “The Ultimates” “Skullkickers” and “Saga”. I could go on, but I would bore you. Favorite Comic Book movie: The Avengers. Easily, the Avengers. Avengers had just the right combination of action and comedy that made me enjoy every minute of it. Though I love movies like the Dark Knight, X-Men 2, Batman, Superman, League of Extraordinary Gentlemen, and Hellboy. Empire's: Nice. We love many of those same books and movies. Of course, you know we love music, too. So, when you're creating comics, what do you listen to? Kyrun: I don’t have one particular artist I listen to. I mostly turn on Slacker Radio and stream music until I’m tired. I grew up a 90’s kid, so my music is filled with a lot of R&B, Alternative and Hip Hop. I throw in some rock every once in awhile, nothing too heavy though. I’ll even listen to gospel and Korean pop sometimes when I draw. Empire's: What are two things you've learned from creating comics? 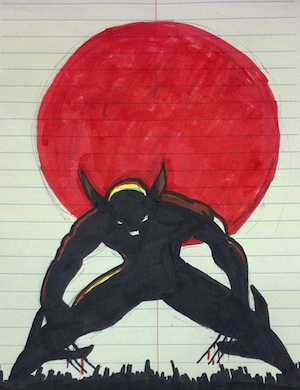 Kyrun: 1) I've learned that I have to get better when it comes to my writing and drawing. Even though I have been drawing since I was 5 years old, there is so much that I need to improve upon to get better and to become more consistent. 2) I've learned that there is so much that goes into creating a book. I knew it was a lot of work before, but the amount of time it takes to produce a book, when you’re doing it on your own is staggering. All the little things no one told me about, like font styles and word balloon placements, I didn’t realize that the little things can take up just as much time as drawing and writing. Empire's: Lastly, as you know, we're big supporters of all things local. Tell us, please, what do you love about Sacramento? Kyrun: I love Sacramento because it’s small enough where if you know someone, more than likely you will have a common friend or relative. It amazes me how often I will meet someone and later find out we have a handful of people we both know. I also love Sacramento because of the diversity. You can walk down most neighborhoods in Sacramento and see so many different cultures and religions and ideas. It’s a huge melting pot and those combinations of different upbringings and backgrounds helps to provide inspiration and great stories. Jared Konopitski will be joining us FCBD 2014! Shane Murphy showcasing Birdland on FCBD 2014! John Cottrell joins us for FCBD 2014! Eric Nguyen will be here FCBD 2014! Timothy Green is back for FCBD 2014!